Once you have decided to run the 1-3-1 defense with your team, it is important that you utilize drills that reinforce the basic tenants of the defense. In this post I will share with you the drills we use to teach slides, coverages, and rebounding in the 1-3-1 defense. I believe in the “whole-part-whole” teaching methodology, so its important to show the entire defense 1st to your team and then utilize breakdown drills. I would recommend watching film with your team showing teams that run the 1-3-1 successfully. This gives kids a great visual on how to play the defense effectively. Anticipation Drills: The first set of drills we use to breakdown the defense are our “Anticipation Drills.” These drills reinforce proper slides, coverages and playing with bounce and energy. Early in the season, we like to make every player go through each of these anticipation drills. Piston Drill: This is by far the most important drill in teaching our 1-3-1. This drill incorporates the pushers and keeper working together in a piston like fashion. They must communicate who is big on ball and who is wide off the ball. In this drill, a coach will start with a ball and a pusher is big on the ball. The keeper than can back off and play the passing lane back to the other coach. 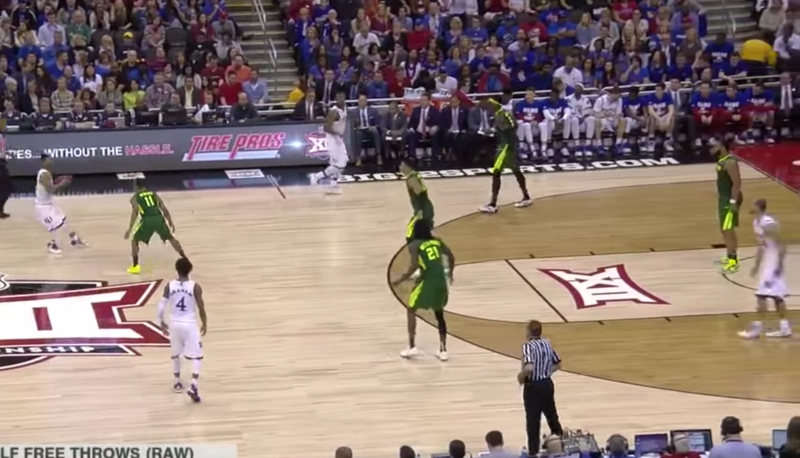 The weak side pusher splits the difference from the block player and other coach. Warrior Drill: This drill is to simulate the warrior getting screened along the baseline which is a common attack we see vs. our 1-3-1. 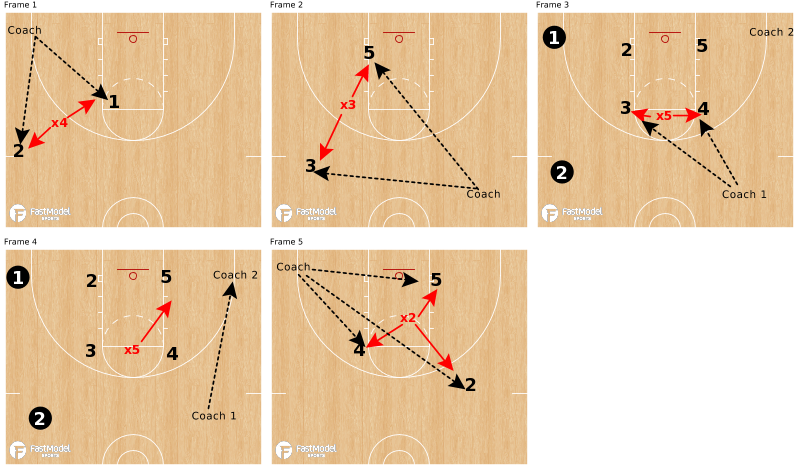 Coaches pass back and forth and the warrior must fight through continuous baseline screens. We teach fighting low through these screens forcing the offense away from scoring area and if we are late to the corner, it funnels the offense back into our umbrella trap. Drill continues for 20-25 seconds or when a certain number of deflections are met. Teaching point is that X1 should always be in line with the basketball. Rebounding Drills and Coverages: If a shot comes from the corner, we are vulnerable on the weak side boards, so we must run our keeper to the weak side boards to help the pusher. Statistically, 7/10 will bounce weak side so we must attack the weak side boards. The clogger must spin and get to the block and box out that area. If a shot is taken from the wing, we form a triangle with our X1 Warrior going to either pinch in the post or go to weak side. We try as much as possible to form a rebounding triangle. 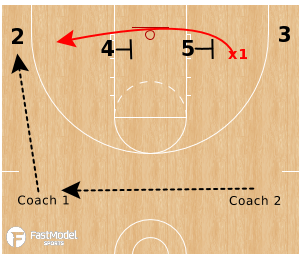 5 Guard 7 Shell: This is the last drill we do as a team to work on our team slides and communication. Defense is obviously at a disadvantage so they must have tremendous bounce, effort, and communication. 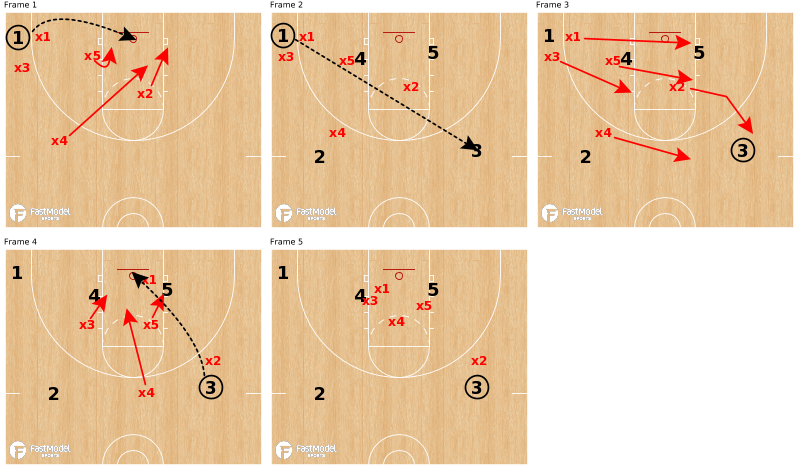 Drill is live and offense tries to score but penetration can only come from the 4 corners of the floor. Block players are stationary and the elbow offensive player goes elbow to elbow. 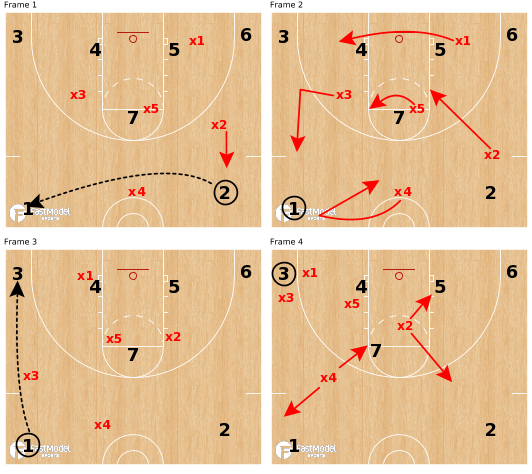 This is a competitive drill and we keep score of both points and offensive rebounds. By putting the defense at a disadvantage by guarding 7 players, we feel guarding 5 will be much easier. I hope you have enjoyed the series on the 1-3-1 defense. If you have any questions feel free to email me at hamiltonr@norman.k12.ok.us or contact me via twitter @TwolvesHoops . How many time a week do you break down the zone?